GSH a day, keeps the doctor away: Glutathione Assay Kits | BioVision, Inc.
MILPITAS, Calif. - Oct. 4, 2017 - PRLog -- Glutathione (GSH) is arguably, the mother of all antioxidants. It has been implicated in the detoxification/elimination of xenobiotics and protecting sulfhydryl groups in proteins. GSH plays a pivotal role in the pathogenesis of numerous human diseases including cancer and cardio-vascular diseases. Glutathione is present in cells in both reduced (GSH) and oxidized (GSSG) forms. Therefore, measurement of intracellular reduced GSH is a sensitive indicator of cell's overall health. BioVision is proud to introduce two revolutionary research tools that specifically detect Reduced Glutathione (Colorimetric and Fluorometric formats). Our kits are the most specific and sensitive quantitative assays in the market because GSSG does not interfere with the assay. The assay kits are simple, reproducible and can specifically detect as low as 10 pmol/well of reduced form of Glutathione (GSH). Explore our newest products detecting Reduced Glutathione as well as other related products that can detect total glutathione and cell-based assay kits. Figures A. Measurement of GSH (1 nmol) and GSSG (100 nmol). Both Assays can effectively discriminate between reduced GSH and oxidized GSSG. Figures B. 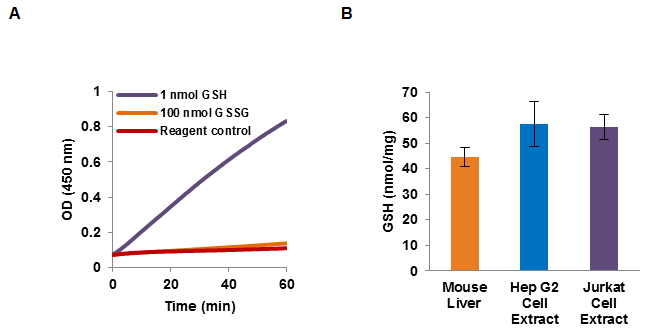 Measurement of reduced GSH in Mouse Liver (10 µg protein), Hep G2 Cell Extract (6 µg protein) and Jurkat Cell Extrac (10 µg protein). All assays were performed following K464-100 protocols.